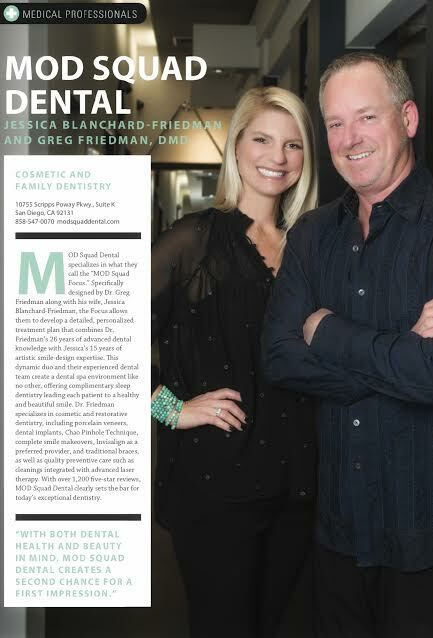 CONGRATULATIONS TO DR. FRIEDMAN & HIS TEAM AT MOD SQUAD DENTAL FOR BEING FEATURED IN SAN DIEGO MAGAZINE’S 2017 TOP DENTIST FOR COSMETIC & FAMILY DENTISTRY RELEASED TODAY!!! Thousands of dentists & dental specialists in the San Diego metropolitan area were asked to vote on who they thought were the TOP DENTISTS of 2017 based on years of experience, continuing education, manner with their patients, use of new techniques & technology in their practice, and of course, physical results. Based on the thousands of detailed evaluations of these dental professionals, we are proud to say Dr. Friedman & his extraordinary team are featured in the April 2017. Pick up your copy today & find out why Dr. Friedman & his squad maintain 5 stars on Yelp, Google+, Judy’s Book, & A+ rating on Angie’s List. Dr. Friedman & his team are always accepting new patients into their dental family. Call today 858-547-0070, & schedule your visit with the best of the best for today’s dentistry.